I thought it might be fun to post a picture & story from your first visit to the Outer Banks. My first visit was in the late '80s, and included my son, Chris, and his best friend, Chris aka Elias. They had decided they wanted to learn how to surf, so I allowed my son to pick the location. He decided Cape Hatteras. This was before there were web sites for lodging on the OBX, so Chris wrote off for brochures on the area, and ended up choosing the Cape Hatteras Motel, specifically in, what is now called, "The Soundside Suites." The furniture was patio furniture with orange, yellow & lime green plastic cushions. Every time you'd stand up from your chair, the cushion remained firmly attached to your legs. The palmetto bugs, in the kitchen, were the size of a Buick. The only laundry facilities in town was an un-air-conditioned laundromat, surrounded by trees & underbrush, and infested with mosquitoes. We sat in the car (with the AC running), and would dash in to start new loads or throw the clothes in the dryer. Still ended up covered in welts. We ate breakfast at the Orange Blossom, lunch at Bubba's BBQ and dinner at Diamond Shoals. We had a riot & have returned to the Outer Banks nearly every year since. In the photo, Elias is on the left and my Chris on the right. The boys are now 44 years old. Good Lord, where did the years go? Here's Chris, wife & daughter from 2 years ago. So glad to introduce another generation to the Outer Banks. Had a blast, and from there a tradition was formed. The people who came down with us have changed a few times over, and we have converted a number of people to the OBX. 1) Getting an ice cream at the DQ inn Avon and finding a twenty dollar bill on the steps. We did several more trips like that one in years following. We learned to prepare better for adverse weather and avoid the heat of the summer. It was a great bonding experience that I'll never forget. It's amazing that 33 years later my wife and I own a place and visit often. It never gets old. First visit 1986, Avon, stayed in a house called Breakers. I have no idea if it’s still in the rental system, with the same agency (OBR) or has the same name. Everything was much more rustic, most of the furniture was wicker with throw pillows, no TV, no phone (and before cells), so had to walk to a nearby corner pay phone to call home, no Food Lion, if in Avon shopped at the Village grocery, which had a smallish bait and tackle, and a few hardware items, in a shop attached to it. If you didn’t get milk as soon as you got there...Forget about it till at least Monday (in the early years, we learned to pack milk so kids would have). Kids embraced the beach life-style, and still do. I’ll have to look for pictures. I grew up in NC and was at the beach just about every weekend. It wasn't the Outer Banks, but it was barrier islands. Carolina/Kure/Fort Fisher area. We'd camp at Carolina Beach State Park and take the trucks up on the beach during the day. Fishing and playing in the water the whole day and then going back and cooking up whatever we caught that night. We'd also crab and fish on the ICW that was right behind the camp ground. Really good fishing back there. Fast forward to 2002. I'm living in the Philly burbs and itching to get back to a Carolina beach. We rented a gorgeous house in Hatteras Village. Southern Cross. It's still there, but has a lot more built up around it now. It was a great time except for my 2 year old daughter got sick (it was her birthday). We had to drive to take her to doctor. She did recover and we had a few beach days. My new digital camera (Canon G2) broke on that trip, so I got a few pictures, but not as many as I usually take. I remember looking at a couple of the lots that were next to the house we rented. We could have bought one, but I didn't want to risk it. That whole area is million dollar homes now. Right across from the ferries, you'll see a row of homes. One of them is Southern Cross. The museum didn't exist back then. Here's a picture I took that year before my camera broke. I don't think that walkway is there anymore. No picture, but my memory of the first time hubby took me to Kitty Hawk was in 1973. We shared a little shotgun style house on the beach road just a short walk from Andersons store. No phone, or a/c. We’d head down to the Foosball Palace, where the dark concrete walls and cold drinks provided a little relief from the heat. As I recall there was a pay phone outside we would use. I think we ate at Seafarer and at the restaurant just across the WM Bridge at Point Harbor. Of course, I loved it and have returned at least once every year since. Got a spreadsheet with yearly rental information to keep the memories alive. Great thread and pics Y!! My first trip down was very memorable. Fall of 1995. I must be getting old because I swore it was 94'. I was 23, and the trip consisted of myself, my ex-husband, our first (and only at that time) child, my brother and sister in-law, and my mother. We stayed OF in Ocean Sands, Sec Q. The house was "St. Tropez" through Carolina Designs. The house is still there and still with Carolina Designs, but now the name is "Michael-Anne" (if memory serves) but the house has certainly changed! At the time it was pretty new and "fancy". It was 4 bedroom then with parking under the house, and it had one of those strange indoor triangular jacuzzi's in an open loft, you know the kind..in the middle of a carpeted room, lol. It was decorated Florida style, AKA "Golden Girl's". Today it is a 6 bedroom, the parking area has been enclosed. There is now a pool, and the freaky jacuzzi is gone..but crazily enough the last time I checked it out it still had the same 80"s/90's glass and chrome dining table! Lots of memories, even 24 years ago the area was much less populated and developed. The wild horses of course played a huge part of our trip. They were everywhere and there was no difficulty trying to "find" one. A group of 4 spent the entire day in the neighborhood. It started off awesome, but I have to admit by mid-week it became annoying. ( Beautiful beyond measure, but annoying. ) They dumped and spread trash every single day. Poop. Lots of poop in the road and on the beach. We saw one walk under the house to the right of us and frankly, made a double mess on and inside the back of a little convertible LeBaron. Not beside. ON. At that time there was also one mare who was known for walking right into the Food Lion. Never mistook the Out door for the In door either! Clever girl! I enjoyed seeing the "Horse Crossing" signs on 12, like we see for deer here in Ohio. Seeing dolphins for the first time. The lighthouse had only been open to visitors for a few years and the Whalehead Club was off limits. My brother and I loved the guard shack on 12 in (or near) Duck. I remember we laughed and wondered if it could tilt back and reveal a secret tunnel, like on "Hogans Hero's". But the real reason I will never forget this trip is OJ Simpson. Like most of America we were hooked on the trial. Most of the people near us on the beach were as well, and lots of us had radios on the beach, or would run back to the house often for updates. Oct 5th was verdict day. No one thought the verdict would come in so quickly! Four hours! Next thing I knew, a man ran to the end of the public access and yelled "The verdict is in! The verdict is in" Granted this was fall in Corolla, not peak season, but since we were one house from the public access our area had quite a few people. Everyone, and I mean everyone jumped, left everything where it sat and headed for their houses. And thats how I got started on the 'banks. My brother hated it so they never came back. My mother believes in seeing someplace new instead of repeating destinations every year, but she has returned one or twice with her new husband since. I kept coming back, and over the years added 3 more children and subtracted one husband. No pics for now - have to check the picture bin when we get home from our two weeks in Atlanta and Naples, FL. We first visited around 1977-78 after listening to my cousins tell us about the Outer Banks. Stayed in the Cabana East Motel on the first several trips. The first local we met was Glen Eure while sitting at the counter of one of the local diners - don’t remember which one. Really interesting guy and he invited us to his Ghost Fleet Gallery. We really like the Stations of the Cross he did for Holy Redeemer - sad to hear of his passing last year. We enjoyed A Restaurant by George at the old Galleon Esplanade, Owens, The Weeping Radish when it was in Manteo, Dareolina Cove, Miller’s and many others. We were staying at the Cabana East when the Pirates played the Orioles in the World Series - a chilly rainy week. We then started staying at the John Yancey - a move up for several years - just my wife and I. For the last 15 years or so we’ve been renting houses in Ocean Sands or Pine Island - always two weeks - we invite family or friends for the first week and then just the two of us for the second week, always for Labor Day weekend and two weeks. Going to get an early week in mid May this year in a South Nags Head condo. 1973 was my first trip. I was a freshman in college and my brother had seen an article in National Geographics about Cape Hatteras. We decided that it would be a great place to visit before heading back to school, so we decided to travel to the Park Campground in Buxton. Three of us made the trip and it was as far from home that we had ever been. To look back on it now, it was quite amazing that our parents allowed us to go. We thought we had traveled to heaven. We spent about 20 hours each day on the beach, in the water or fishing. All we needed for food was beer, peanut butter, tang (remember that!) and the fresh fish we caught. It became an annual tradition for us to head down before we began a new year of college and each year our numbers grew. We continued to camp until we graduated, got jobs and were able to afford to rent a house. We had camped through some wicked storms where every tent in the campground was knocked down by the winds and every stitch of clothing that we had was soaked. Looked like a lake at the campground! Then we had to wait in line at a laundromat in Buxton to dry our belongings. While our clothes were in the machines, I remember sitting in a diner (no longer there) close to Conner's Food Market, shivering in dripping sweat pants and shirt, eating grits and hot coffee while ladies with white netting covering their hair, waited on us and said a prayer with us as it was Sunday. I've been going back annually for 40 years now and wish I could re-live every trip, each one different and so full of memories. Now I am lucky enough to own a home in Frisco, so my visits are more frequent. Beautiful stories - and some very colorful ones, too. Keep 'em coming! I don't have a photograph handy from my first visit was when I was about 8 or 10 years old - which means that was quite a few years ago since Medicare will soon be available to me. I was with my parents and my older sister. We'd been to visit my brother at UNC Chapel Hill and then made a little trip down here. We have home movies of me running around the Cape Hatteras Lighthouse in a navy blue windbreaker. Second visit, I believe, was in 1987. Brought my soon to be husband with me to meet some college friends and we rented a house in Frisco called The McCluskey on Robin Lane. The house still exists though it is called something else. It's beach front and the Billy Mitchell airfield is just to its left, looking towards the ocean. Thus began our pretty much annual trip(s) to Frisco, with daughter, daughter's boyfriend, our dog and our friends...and now we live in Manteo, full-time. 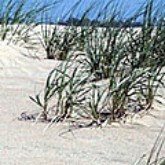 The photo is the same as my icon - two wild horses on Ocracoke. P.S. Oh yes, I used to insist that we sleep with the windows open (post Labor Day visits) so I could hear the ocean. My first visit was in 1999, with my husband, my sister and her daughters. We rented a beach box near Avalon Pier. We spent a day on Ocracoke and stopped to see the Hatteras Lighthouse, which was being moved, on our way down and Bodie (briefly) on our way back. We spent part of a day in Corolla, visiting the lighthouse and the beach there. The photo below was taken in Avon on 8/23/11. The night before we evacuated for Hurricane Irene. Even though we only spent 4 nights, we knew that this was where we would vacation every summer. When we saw how pet friendly Hatteras Island was, we went to our local SPCA a week after we got home, and adopted Hunter. He's been with us on every trip, since we would never kennel a dog of ours. Our countdown is 190 days and while I'm apprehensive of crossing The new Bonner bridge (don't care what they call it), It will be worth it. I'll have to search for pics, first visit was 1988 Ocean Sands, Sand Castle. section q? The house was 3 or 4 lots back but had a clear view of the ocean, not a lot of houses in front. There was no Food Lion up there, no big houses no swimming pools. The house didn't have cable but who is watching tv anyway! We were on vacation. The house went for $350 a week had 2.5 baths. 3 bedrooms and loft, great room, lots of decking it was great! There was a Winks and the road ended not far from the Ace? True Value up there. The realtor was Kabler and Riggs. Nothing to do but go to the beach or hang out on the deck. and that was enough. I remember the first trip so well. It was our honeymoon in June '86. My husband and his family had been coming for years. We stayed at Colony by the Sea. Went to a time share meeting for the "new Barrier Island Station". Did not buy but did get treated to dinner at their restaurant, a tank of gas from Wee Winks and some kind of picnic thing. Drove up to Corolla to the abandoned lighthouse and Whatlehead Club. Cut a trail to the lighthouse from the main road - lots of deer flies and mosquitos. Wild horses were roaming everywhere. My husband caught a huge flounder in the surf and we had to go to the bookstore for a cookbook to see how to cook a whole fish. We still use that cookbook - Tea Time at the Masters. We have visited every year since. Most years several times. My husband has the family record of 5 times in one year. This is a great thread - keep the stories coming! It was 2009. Me, my husband, 14yo daughter, 15 yo son, his girlfriend and our 2 yo son. Stayed in Corolla on Corolla in Whalehead. House was Wish you Were Here. Still there. We’ve come down every year since. We try a new home every year and have stayed in Duck as well. Our first house is still our favorite. Nags Head (it was all called Nags Head then) with my folks around '67. Many surf/camp trips during the 70's (and ever since) all over Town and Hatteras Island. Kept a camper in Rodanthe and camped at Rodanthe Watersports & Campground with Mrs. Moonrise every other weekend May-Nov starting around 2000. Bought our place in Rodanthe in 2011 and we are there pretty much every weekend March - Nov. It was 2007, just hubby and I. We rented an OF cottage in Kitty Hawk and it was perfect! Husband literally grilled on the beach and he still tells people about it. We didn't do much sight seeing that year just couldn't pull our selves away from the fu. Of walking out the front door right to the water. I'll have to look for some of the pics. Since then we've slowly migrated southward. We've rented in Buxton the last 3 years. My first visits was around 1992-ish. I was stationed up at Norfolk/Newport News. My friends and I would drive down sometimes for the weekend, sometimes just for the day. Sometimes we'd have a surf board with us, sometimes not. They usually were not planned evolutions... just last minute "hey - let's go!!" kind of trips. I was a bit of a photography buff and I made a few solo trips to take pictures at Elizabethan Gardens and such. The last time I was at the Hatteras Lighthouse was the year before they moved it. Got stationed on the west coast. This is a picture of my good friend James. We were at Ocracoke, I believe. I think this is there on the edge of the lake. My first trip down was in 1972 when I was 11. I just remember how rough the water was and the terrible undertow. I was with a cousin, Aunt and friend of my Aunt's. I remember my Aunt's friend fell in the water and couldn't get up. She was a larger person and just kept laughing and rolling around in the water. My older sister used to go down with her sorority sisters and they would rent a cottage. That was all I knew about it. We went to the Lost Colony outdoor play. Other than that I don't remember much else. I believe we stayed in the old London Inn motel while we were there. It was the first time I had salt water taffy. And the foosball palace was the best! I don't think I have ever missed a year going down since then. And yes, it was called Nags Head! Fast forward 20 years to the first family vacation on the banks. 2011 was the year. My son was 10 and my daughter was 7. We drove down from Indiana and stayed at the OBX Motor Lodge. Had an ocean front room for $99 a night. Take three steps out of the door and your feet hit the sand! We were on a budget, so it was only for 4 nights. The kids went on a pirate cruise over at Manteo. We took the ferry to O'coke. Fished at Jennette's. Walked the beach hunting ghost crabs every night. It was the kids' first time being at the ocean. It was also the longest distance we had gone for a vacation to date. We couldn't keep our daughter out of the water. It was either the pool, or the ocean. She didn't care which - she just wanted to be in the water. Had a great time. Seems so long ago... yet at the same time, it feels like yesterday. We've always gone back every 2 years. A few times my sister and her family joined us. The last time, in 2017, was our first time staying south of the bonner in Waves. This year, we'll be in Avon. I figure that by the time I retire, my wife and I will be on O'coke. My son is 18 now and at 6' 2" he has me by a few inches. He's a candidate for the Naval and Air Force Academy, looking forward to flying. My daughter is 15 and swims on the high school team. Here's a photo of us at their first visit to Jockey's Ridge. August 1968. My parents took my two older brothers and me camping in a tent trailer at the Salvo NPS campground. No electric, no A/C, no TV, no running water other than at the community faucet, no hot showers, no flush toilets. But for an 11 year old boy, it was an adventure of a lifetime. Looking for shells at the beach, swimming in the ocean, going to the Hatteras fish fry and having my first hush puppies. It's amazing that after 50 years I still remember the trip. I remember the mosquito spray truck coming every night and us dumb kids running through the cloud, not knowing what nasty chemicals were in it. Sleeping was a challenge as it never really cooled off at night, although the breeze helped to cool the trailer. To this day, I don't know how my parents stood the heat. I had a very similar experience as you Skipster...Our first trip was not much different from the many that followed. July 1969, my parents took my sister and I tent camping for two weeks at the NPS Buxton campground. Two young children (one still in washable diapers), no air conditioning in the station wagon, water and bathing from the campground roadside spigot, cooked all meals at the picnic table. My dad said their biggest expense for the trip was ice. We tent camped for the next 3 years until we graduated to being tent trailer dwellers (always for two weeks over July 4th at the NPS Buxton campground). That trailer lasted a few years until it was shredded by a storm (while we were in it). I have no idea how my parents made those trips so amazing without all the creature comforts we all now seem to expect? My parents purchased a lot in Salvo in 1972, and on windy days we would take a break from the campground to use the Colony community pool where the Village Conery now stands. My fondest memories involve fishing with my dad (at an "empty" Point, in the Salt Pond, at the Canadian Hole before it became a parking lot, and at the drainage ponds behind the NPS Buxton campground). Unfortunately those places no longer exist as they once did. We caught crabs, gathered scallops and oysters, and snorkeled at the Canadian Hole without a sole in sight! We would climb the lighthouse anytime we wanted and we got to experience sitting atop after sunset while the light came on. The Ranger was always friendly when he would ask us to head down so that he could close it for the night. My mom would save quarters all year long to pay for a deep sea fishing trip with Ernie Foster on the Albatross. The first trip was early 70's on the Albatross I where my parents doubled up on white marlins. We always went out with Ernie and favored being on the Albatross III. I really miss sitting on the dock with Captain Ernal while he whittled in his chair. Hatteras is not even remotely close to being the desolate place that we remember. But I am blessed that I have parents who provided us the opportunity to experience things that many never will. Although I cherish every moment I now have with my kids at the home in Salvo, I wish they could experience the Hatteras I remember back in our camping days. Ours was honeymoon in 1990 at my wife's aunt and uncle's house. Went there every year to 2013 except 2003. Bought a house 6 years ago. My wife's uncle passed away a year ago this month. Great guy.